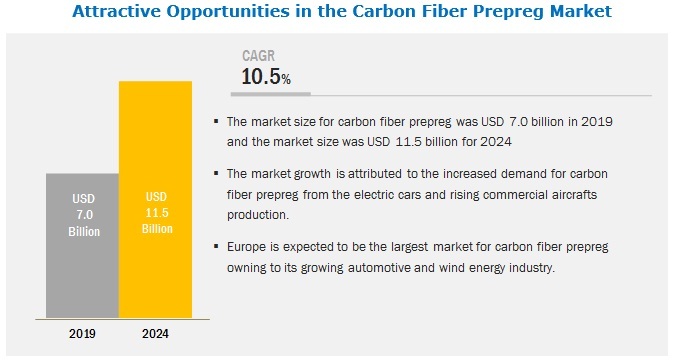 [160 Pages Report] The carbon fiber prepreg market is projected to grow from USD 7.0 billion in 2019 to USD 11.5 billion by 2024, at a CAGR of 10.5% between 2019 and 2024. The market is growing due to its increasing demand from aerospace & defense, automotive, and wind energy industries. The major end-user industries in the carbon fiber prepreg market include aerospace & defense, automotive, sports & recreation, and wind energy. The aerospace & defense industry accounted for a major share of the market, in terms of value and volume. This is due to the increased production of aircraft by Boeing and Airbus. Boeing and Airbus have a projected demand for nearly 9,000 new wide-bodied aircraft over the next 20 years. The use of carbon fiber prepreg in narrow-body aircraft is also witnessing growth t. According to The Teal Group, aircraft production is set to grow at 5.8% annually, from an estimated market size of USD 164 billion in 2017 to USD 218 billion by 2022. Epoxy resins dominate the overall carbon fiber prepreg market as they are widely applicable in aerospace & defense, automotive, sports & recreation, wind energy, and other industries. The processing cost of epoxy resins is high for various end-use applications; which makes them very expensive. However, due to their rigid inter-linking molecular structure, inert chemical composition, and resistance to UV and chemical attack, epoxy resins are very durable. Epoxy resin with carbon fiber reinforcement is primarily used in aerospace & defense and automotive industries. It also has a faster curing time compared to other thermoset resins, which makes it the preferred choice among automakers. Europe is expected to lead the carbon fiber prepreg market during the forecast period. Europe is a key carbon fiber prepreg market films market. The market is growing due to the high demand for materials with excellent strength, lightweight, and chemical and corrosion resistance properties. The market in the region is driven by the presence of large aircraft manufacturers, electric car manufacturers, and offshore wind farm installations in the region. In 2015, BMW started using carbon fiber implants in its 7-series sedan. There are a large number of offshore wind energy installations, especially in the UK and Germany. According to the Global Wind Energy Council (GWEC), the UK added 1,680 MW of offshore wind power capacity in 2017, which is almost 39% of capacity addition in the global offshore wind capacity in 2017. The carbon fiber prepreg market comprises major solution providers, such as SGL Group (Wiesbaden, Germany), Gurit Holdings AG (Wattwil, Switzerland), Park Electrochemical Corporation (Melville, U.S.), Toray Industries (Tokyo, Japan), Teijin Limited (Osaka, Japan), Royal TenCate N.V. (Almeo, The Netherlands), Hexcel Corporation (Connecticut, US), Solvay (Brussels, Belgium), Mitsubishi Rayon Co. Ltd. (Tokyo, Japan), Axiom Materials (California, US). The study includes an in-depth competitive analysis of these key players in the carbon fiber prepreg market, with their company profiles, recent developments, and key market strategies. Solvay is one of the prime manufacturers of carbon fiber prepreg in the European region. The company possesses extensive product portfolio pertaining to carbon fiber prepregs. It gives immense emphasis on the development of high-grade carbon fiber prepregs for usage in various end-use industries. As a part of its growth strategy, the company is highly focused on expansions and agreements. For instance, in November 2017, the company entered into an agreement with Strata (UAE), an advanced composite aerostructures manufacturing facility, for the supply of aerospace materials for the Boeing 777X aircraft. In May 2017, Hexcel Corporation entered into an agreement with Irkut Corporation (Russia) for the supply of HexPly carbon fiber/epoxy prepreg for the MC-21-300 new generation commercial aircraft. In March 2017, Solvay launched SolvaLite 730 prepreg for high volume automotive applications. It provides sub 60 seconds cure capability, exceptional toughness, and low tack. It is storage stable at room temperature. In March 2017, Toray Industries, Inc. expanded its carbon fiber capacity at its Jalisco plant in Mexico. This expansion will support the company’s strategy of meeting the growing demand for prepreg for automotive and wind energy applications. Which are the major end-use industries of carbon fiber prepreg? Which industry is the major consumer of carbon fiber prepreg? Which region is the largest and fastest-growing market for carbon fiber prepreg? What are the major resins used in manufacturing carbon fiber prepreg? What are the major strategies adopted by leading market players? 12.1 Mitsubishi Rayon Co. Ltd.
12.11.3 Taiwan First Li-Bond Co., Ltd. The study involved four major activities to estimate the current market size for carbon fiber prepreg market. Exhaustive secondary research was done to collect information on the market, the peer market, and parent market. The next step was to validate these findings, assumptions, and sizing with industry experts across value chain through primary research. Both top-down and bottom-up approaches were employed to estimate the complete market size. Thereafter, market breakdown and data triangulation procedures were used to estimate the size of market segments and subsegments. In the secondary research process, various secondary sources such as Hoovers, Bloomberg BusinessWeek, and Factiva were referred to, so as to identify and collect information for this study. These secondary sources included annual reports, press releases & investor presentations of companies, white papers, certified publications, articles by recognized authors, gold standard & silver standard websites, regulatory bodies, trade directories, and databases. 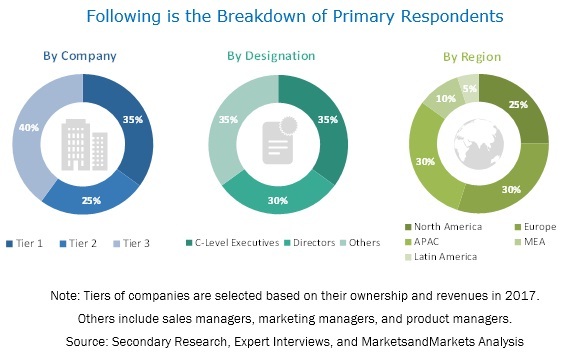 The carbon fiber prepreg market comprises several stakeholders such as raw material suppliers, processors, end-product manufacturers, and regulatory organizations in the supply chain. The demand side of this market is characterized by the development of various industries such as aerospace & defense, wind energy, sports & recreation, automotive, and other industries. The supply side is characterized by advancements in technology and diverse applications. Various primary sources from both the supply and demand sides of the market were interviewed to obtain qualitative and quantitative information. After arriving at the overall market size using the market size estimation processes as explained above, the market was split into several segments and subsegments. In order to complete the overall market engineering process and arrive at the exact statistics of each market segment and subsegment, the data triangulation and market breakdown procedures were employed, wherever applicable. The data was triangulated by studying various factors and trends from both demand and supply sides in the aerospace & defense, wind energy, sports & recreation, automotive, and other industries. This research report categorizes the carbon fiber prepreg market based on resin type, manufacturing process, end-use industry, and region.